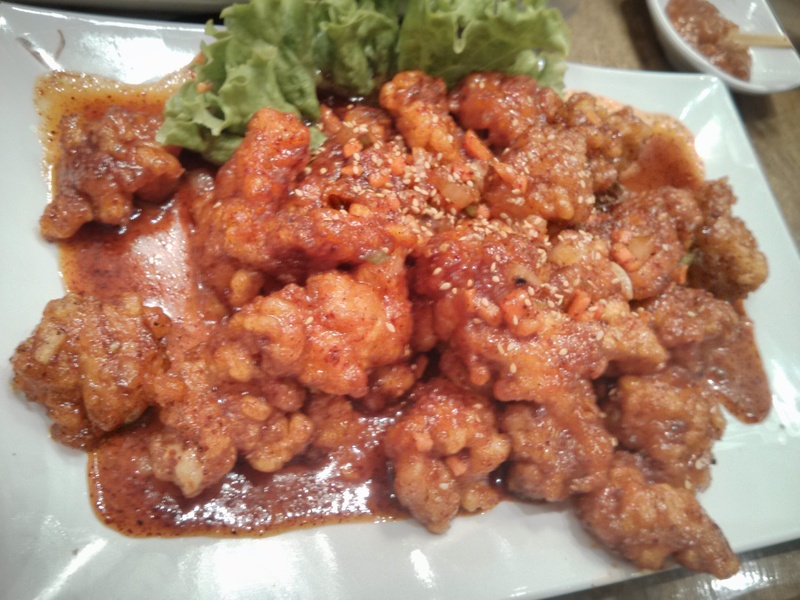 My high school friends and I decided to eat at Buk Chang Dong Soon Tofu for dinner last month. 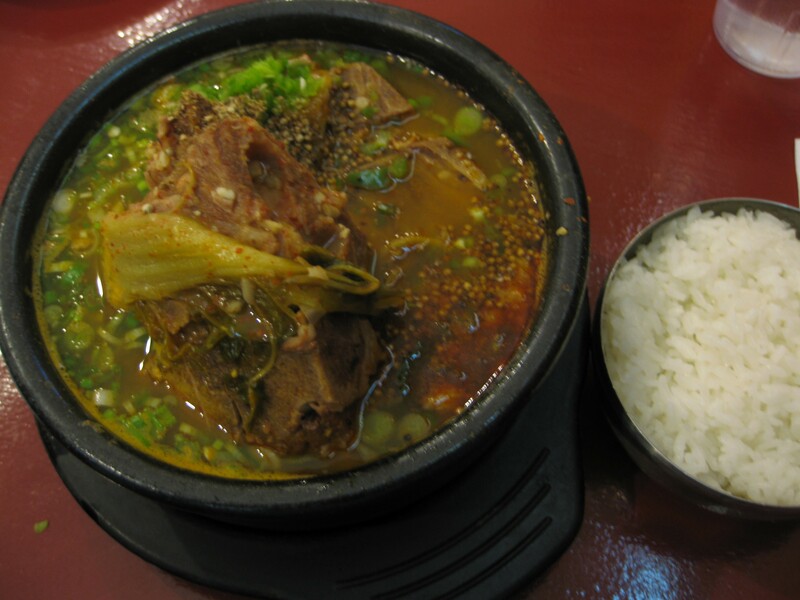 We go to Buk Chang Dong for soon tofu similar to how we go to Owl of Minerva’s for pork bone soup. A meal here is $10 with tax and tip. 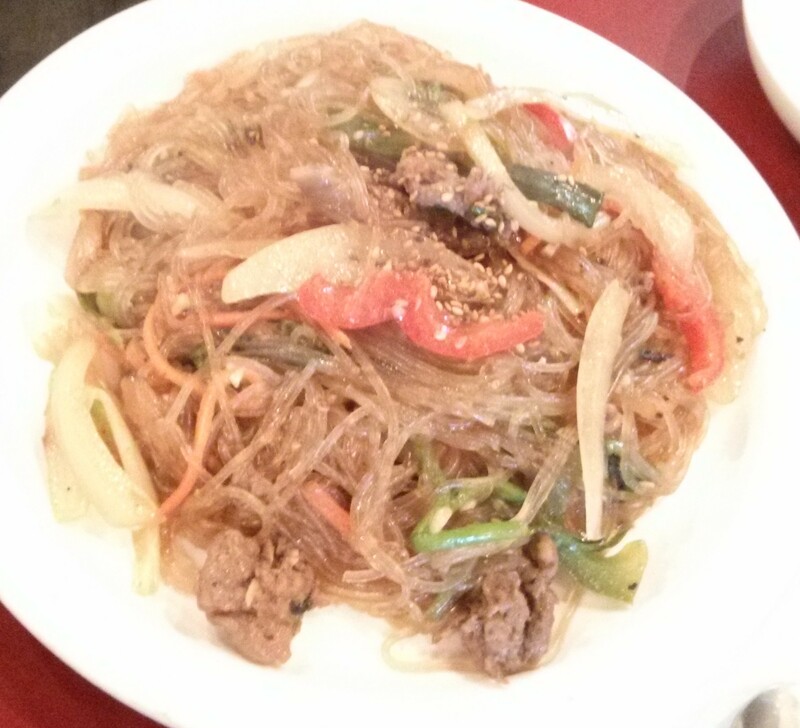 Their menu is mainly a variety of soon tofu however you could also get bibimbap or bulgogi. The restaurant is cosy but the lighting is bright. All of the soon tofu comes with purple rice and you can choose the spiciness level of the broth which ranges from no spice to very spicy. 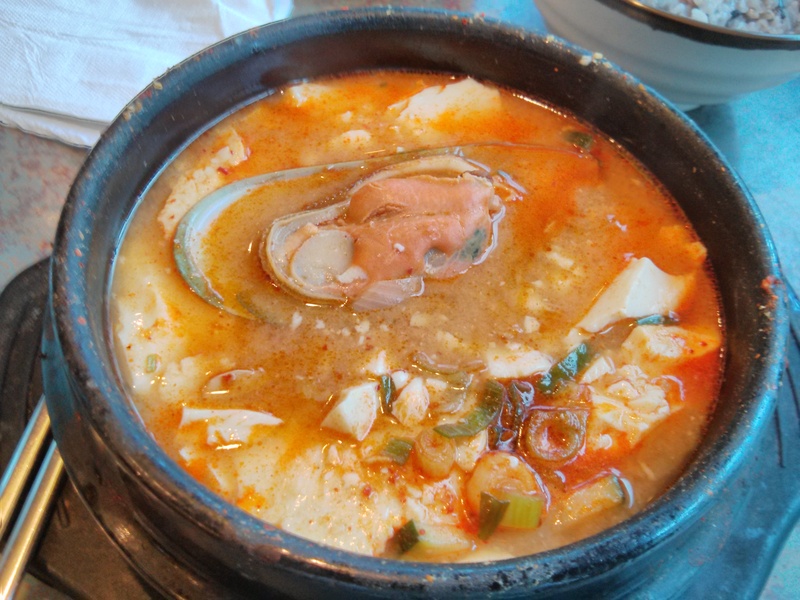 A friend ordered the combination soon tofu which has a decent sized mussel, shrimp and beef along with tofu in a spicy broth. It comes with a raw egg that you crack into the soon tofu. 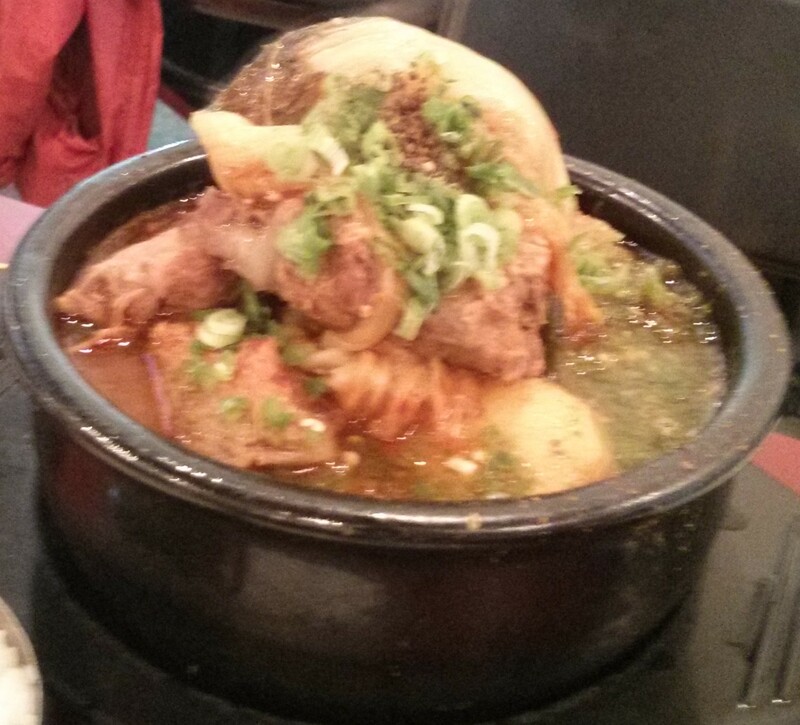 Another friend ordered the dumpling soon tofu which has dumplings, beef and tofu in a spicy broth. 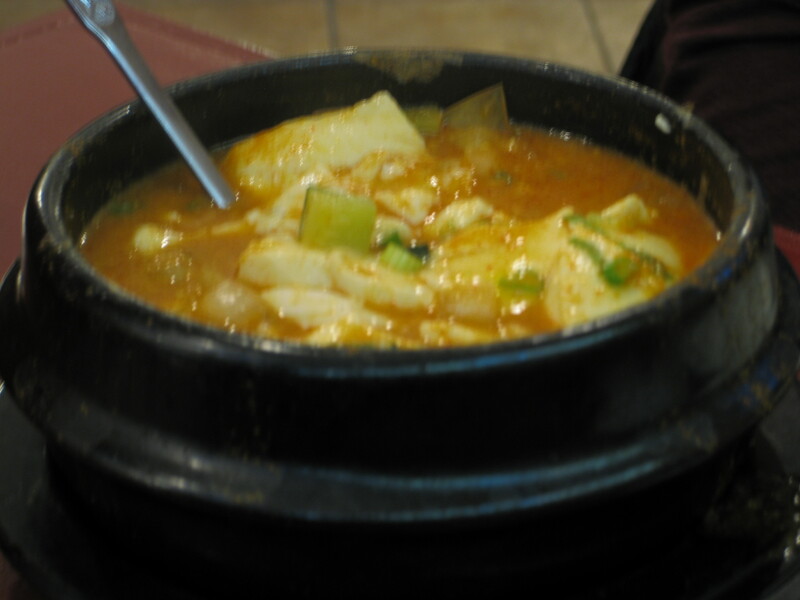 A third friend had the kimchi soon tofu which has kimchi, beef, pork and tofu in a spicy broth. 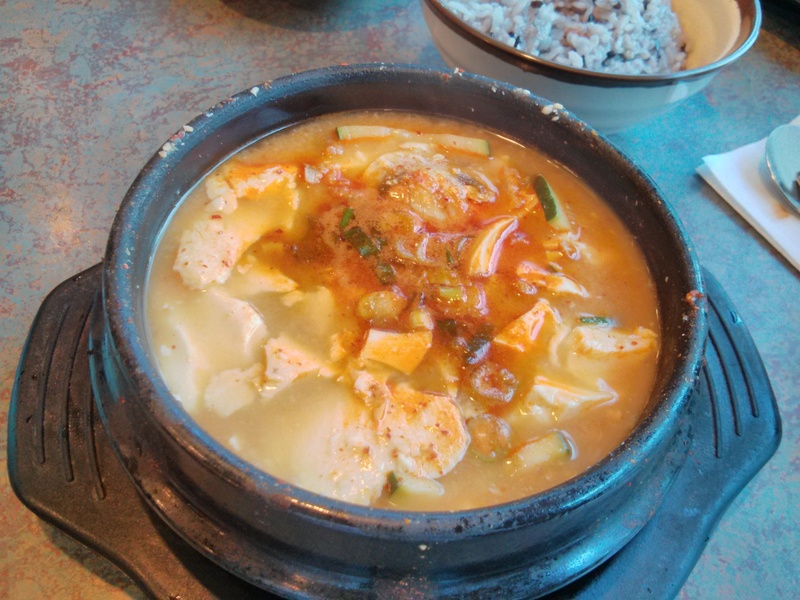 A fourth friend had the Veggie soon tofu which has mushroom, broccoli, onion, zucchini and tofu in a spicy broth. They all come with a raw egg as well. I ordered the soybean soon tofu. 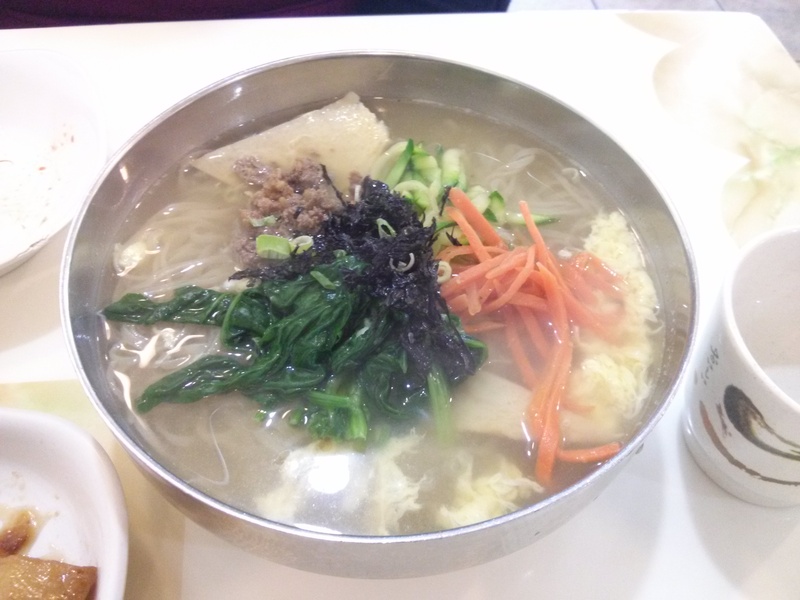 The broth is soybean based as opposed to its regular broth and it doesn’t come with a raw egg. 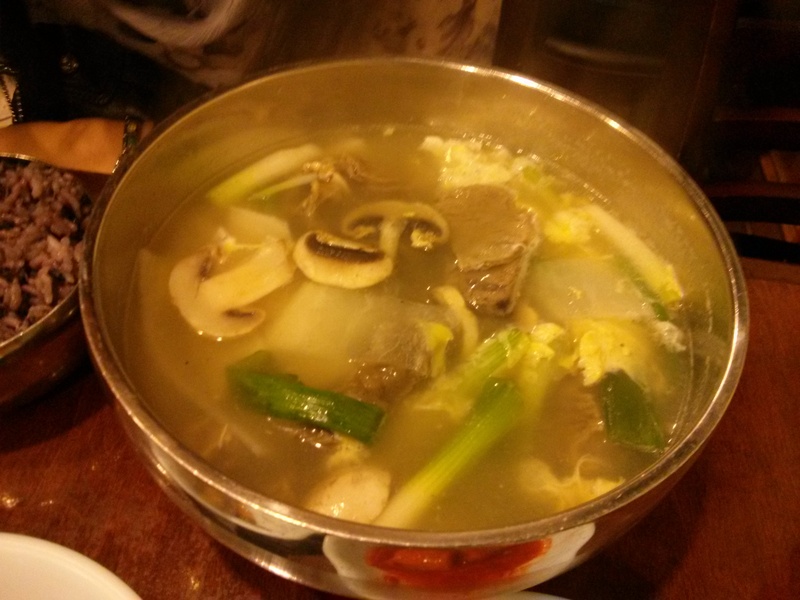 The soybean soon tofu has beef, mushroom, a decent sized mussel and tofu. 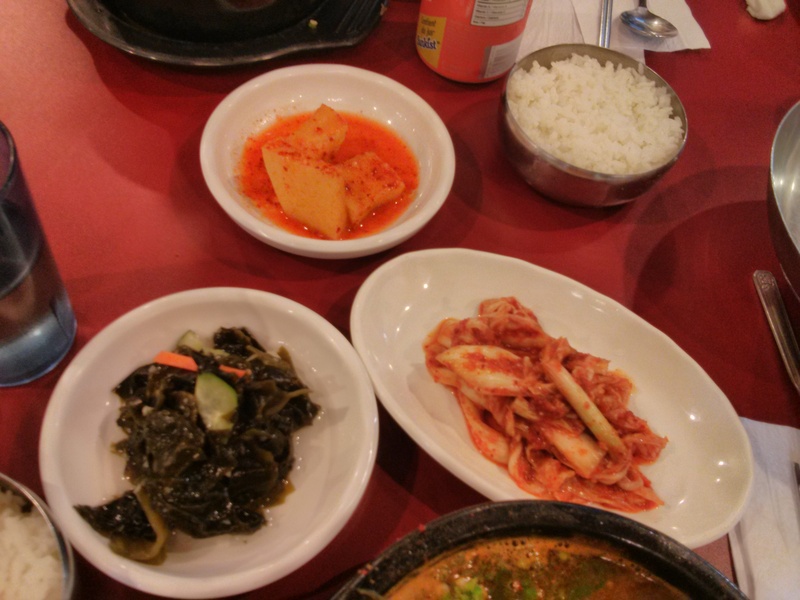 If you have a craving for soon tofu in either downtown Koreatown or uptown Koreatown then you should eat here. 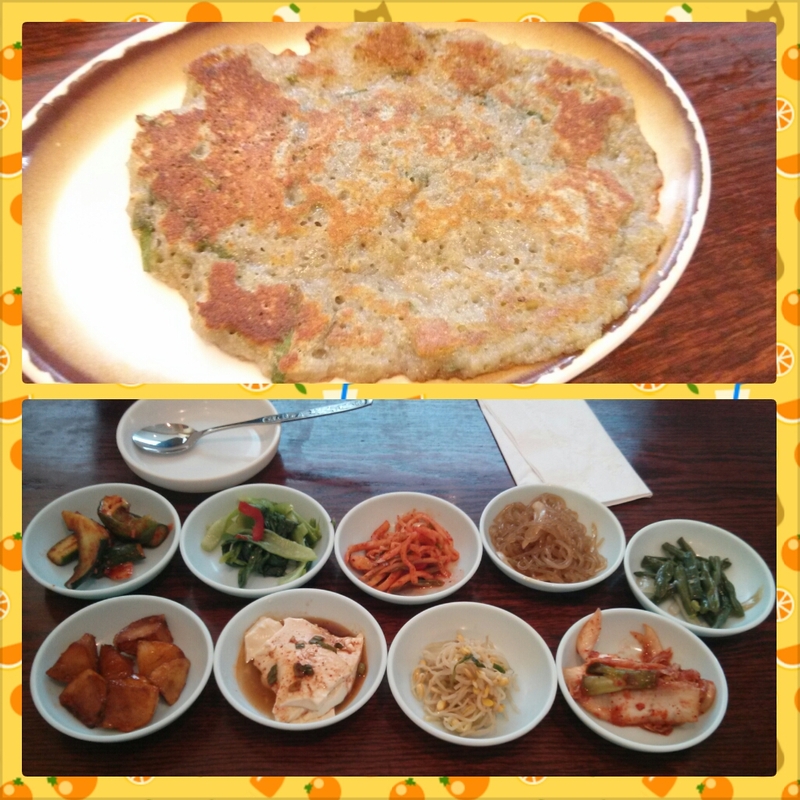 My friends and I decided to have lunch at Jeon Ju. I decided to get a combo. 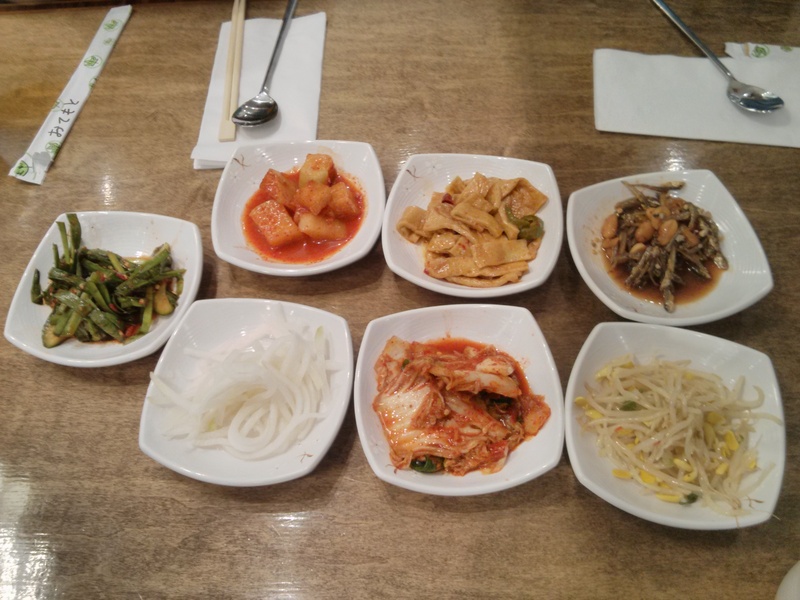 I got the mackerel and kimchi chi gae ($9.99). 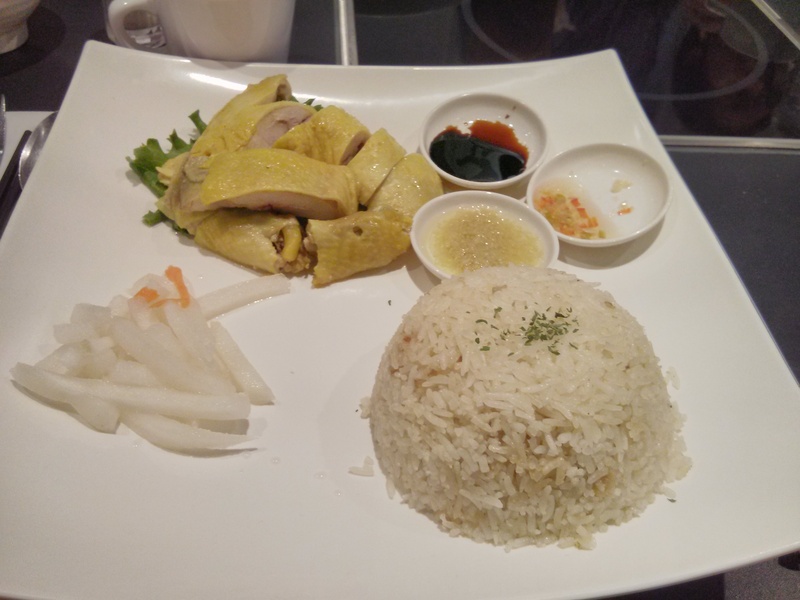 Another friend had the mackerel and soon tofu combo ($8.99) instead. 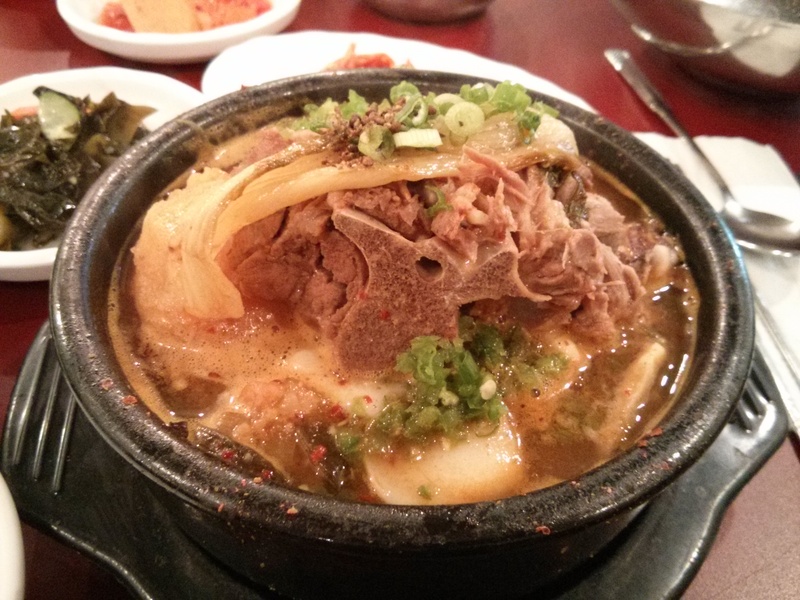 It comes with a bowl of white rice and numerous side dishes. 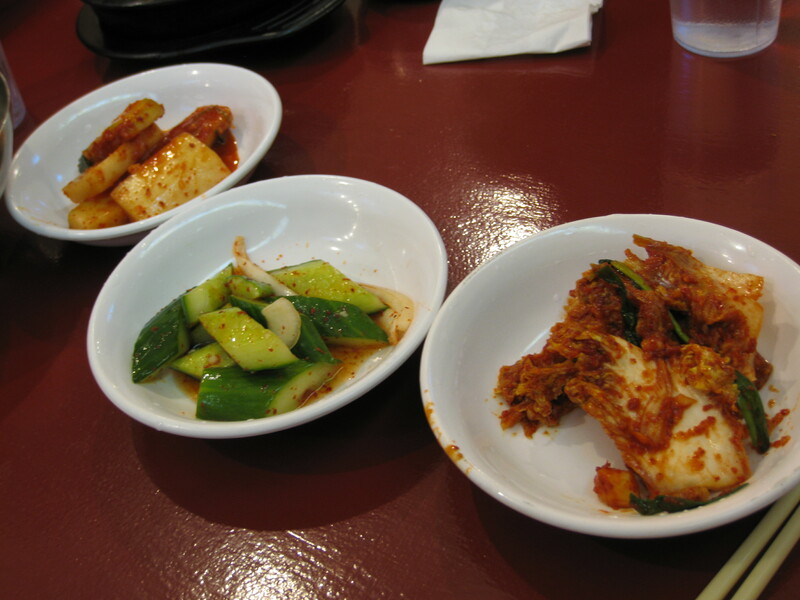 I was only able to finish eating the mackerel and a spoonful of the kimchi chi gae. 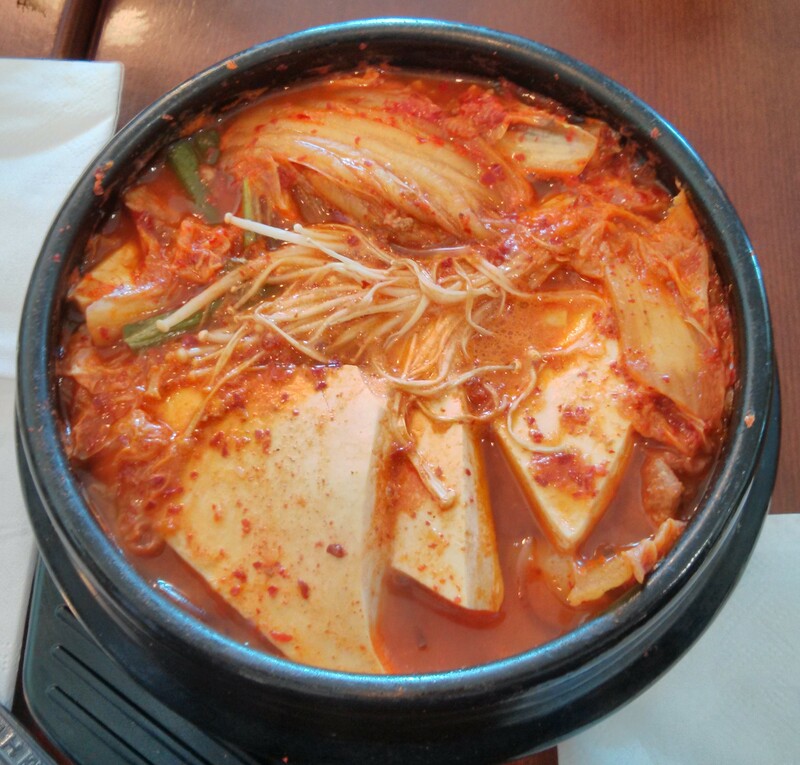 The kimchi chi gae has 3 slices of tofu, enoki mushroom, green onions, kimchi, slices of pork, rice cakes and the fat, clear noodles. 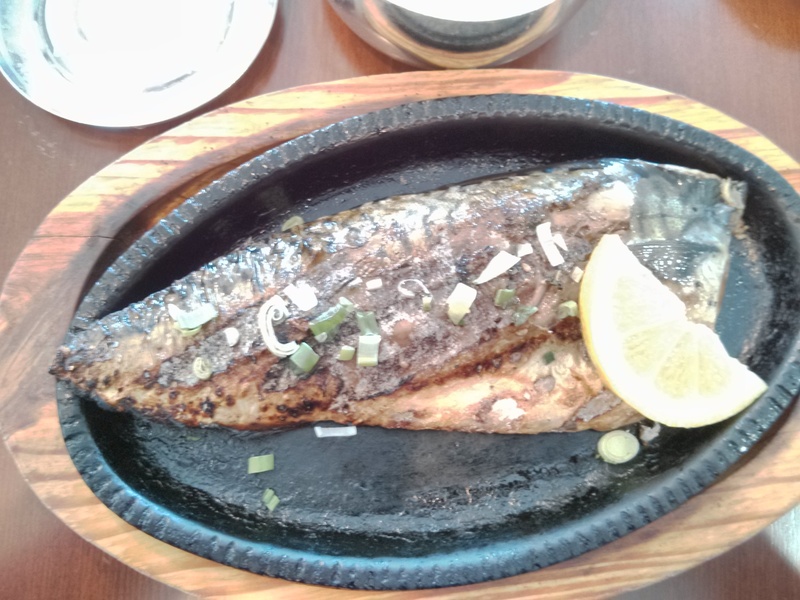 The mackerel is grilled Korean style. 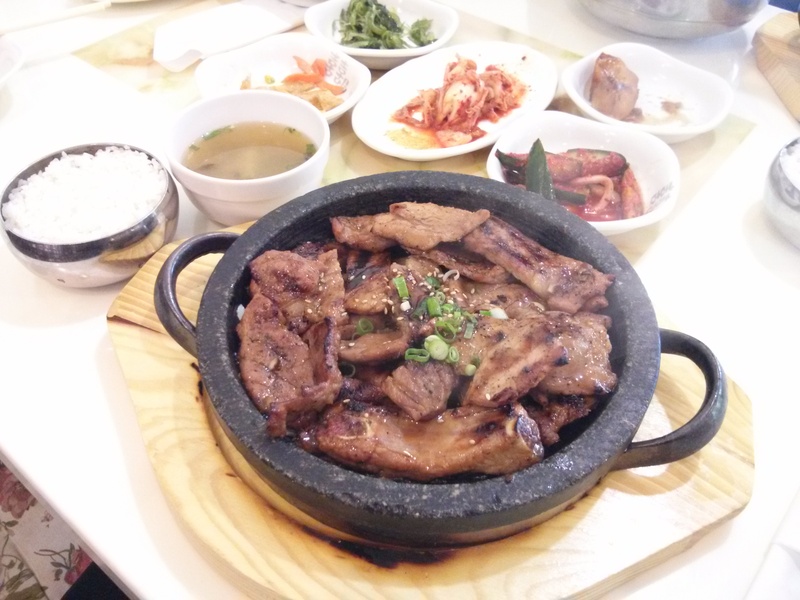 It is served on a sizzling plate and garnished with a lemon wedge and a sprinkle of green onions. The mackerel I had had lots of bones in it while the mackerel my friend had had no bones. Overall, the mackerel and soup combo tastes yummy at a decent price. I’ve been to Gal’s Sushi multiple times in the past. The last time I came here was with a bunch of friends for lunch on Sunday in early November. 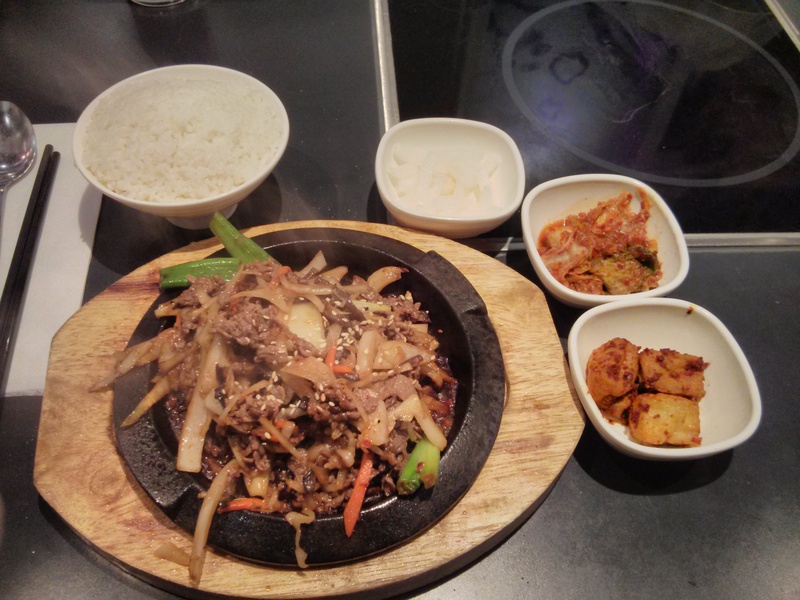 It’s a Japanese-Korean restaurant that makes delicious and authentic Japanese and Korean food in Markham. It’s a fairly large restaurant with a nice ambiance however the lighting there is quite dim. 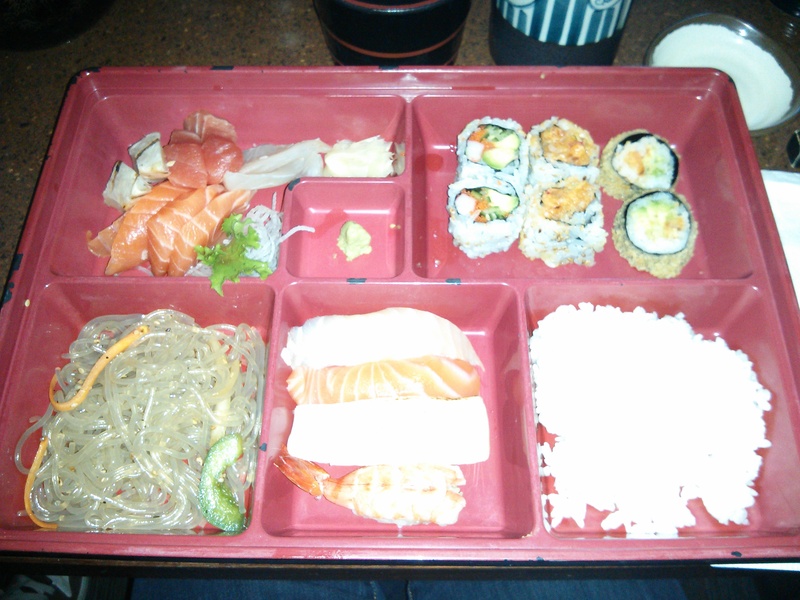 I had the Sashimi, Sushi and Rolls Bento box ($8.99). It includes miso soup, house salad, noodles, rice and a small selection of sashimi, sushi and rolls. The sashimi are red and white tuna, salmon and red snapper. The sushi are shrimp, salmon, yellow tail and white tuna. The rolls are 2 pieces of 3 varieties which are spicy salmon, california roll and dynamite roll. 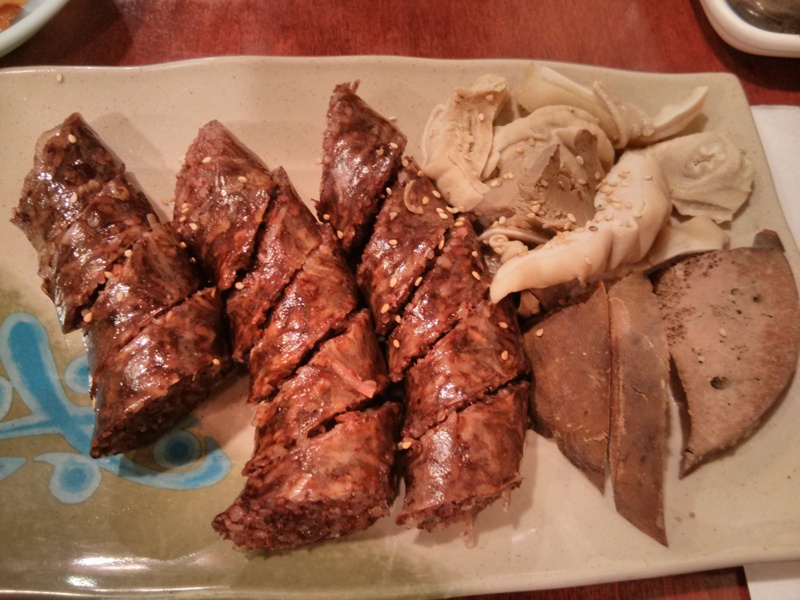 If you’re in Markham and craving Japanese or Korean food then I recommend coming here. I’ve been to this restaurant many times over the past 6 years. It’s as established as Sapporo Sushi and Owl of Minerva in the neighbourhood of Yonge Street between Shepperd Ave and Finch Ave. My high school Korean friend first recommended this restaurant to me. 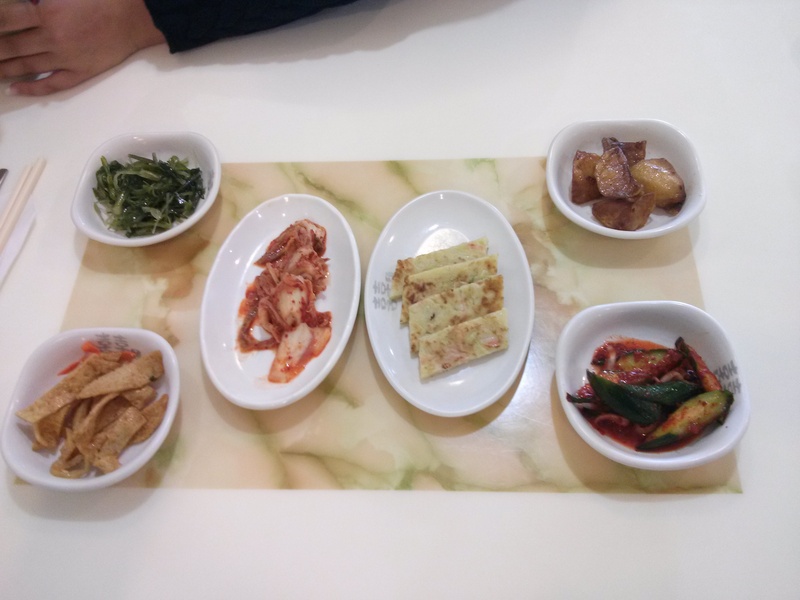 In this neighbourhood, if you want pork bone soup you go to Owl of Minerva and if you want soon tofu you go to Buk Chang Dong Soon Tofu and for everything else there’s Oh Geul Boh Geul! On one side of the restaurant there are a row of wooden booths that can seat up to a group of 8. On the other side of the restaurant there are regular tables and chairs. The restaurant is quite small and there is an outdoor patio in the back although my friends and I always sit inside. The parking lot is shared with Owl of Minerva and it’s quite small. 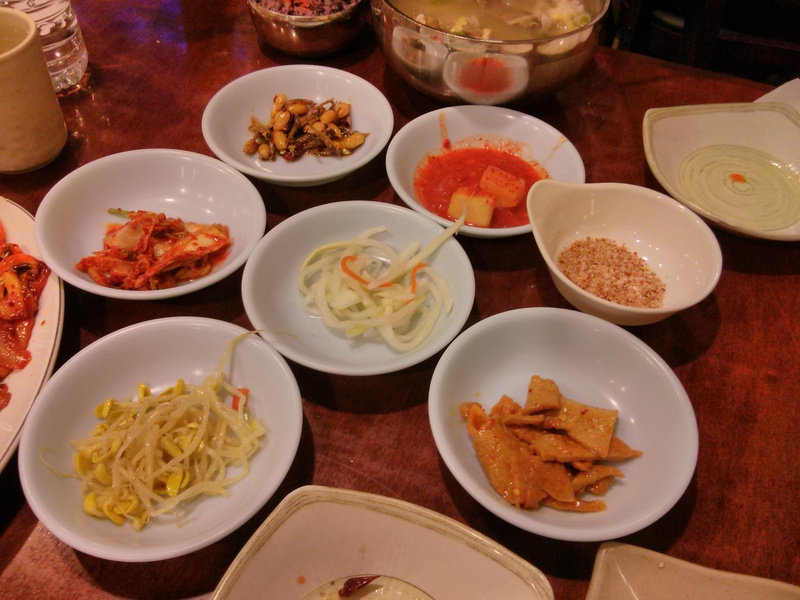 Oh Geul Buk Geul has the most variety of kimchi! 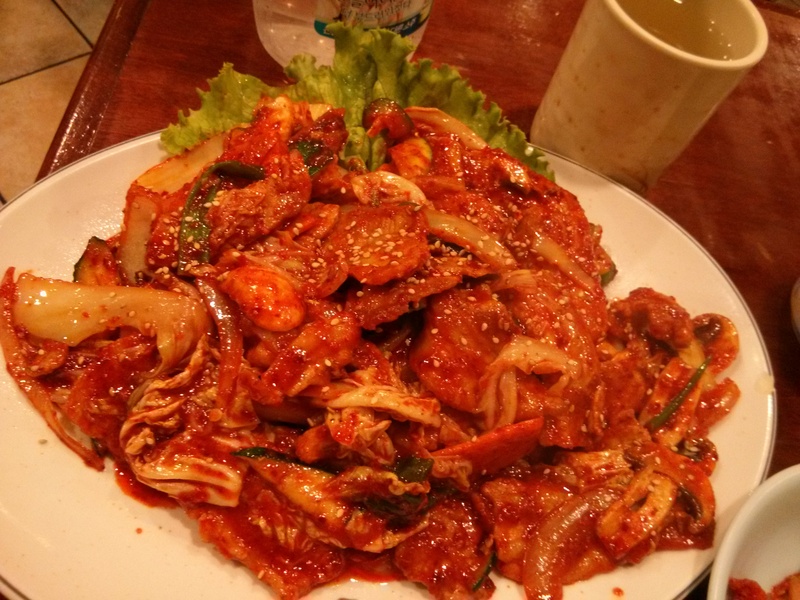 Most recently I went with a university friend to Oh Geul Boh Geul back in mid-June. 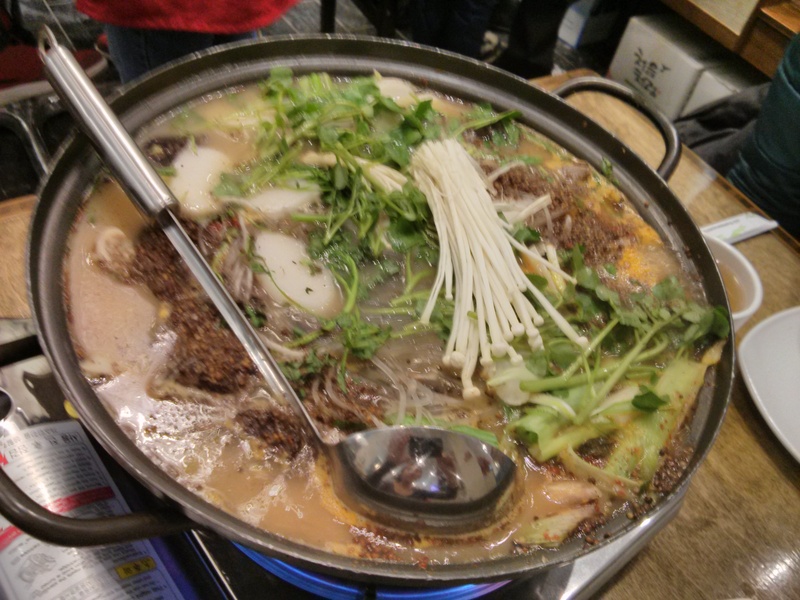 She had the naengmyun ($10) while I had jajamyun ($8). 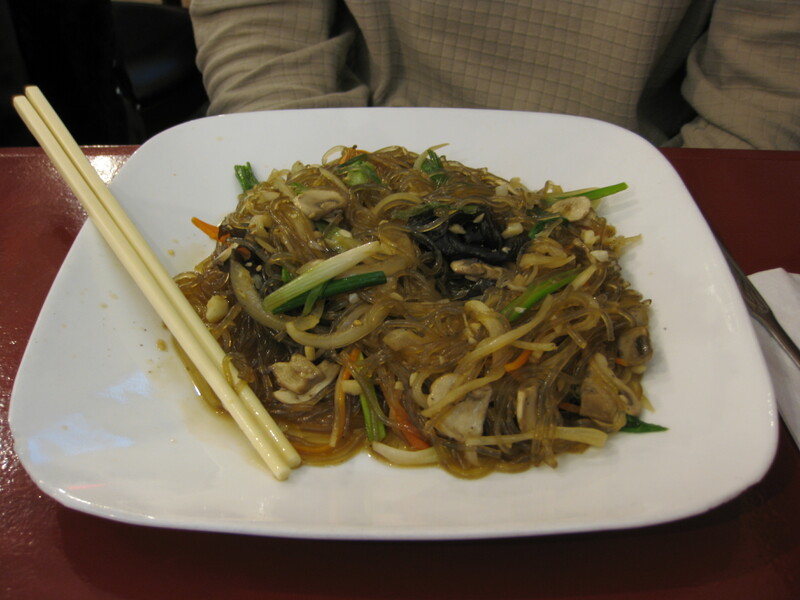 Naengmyun is cold buckwheat noodles. 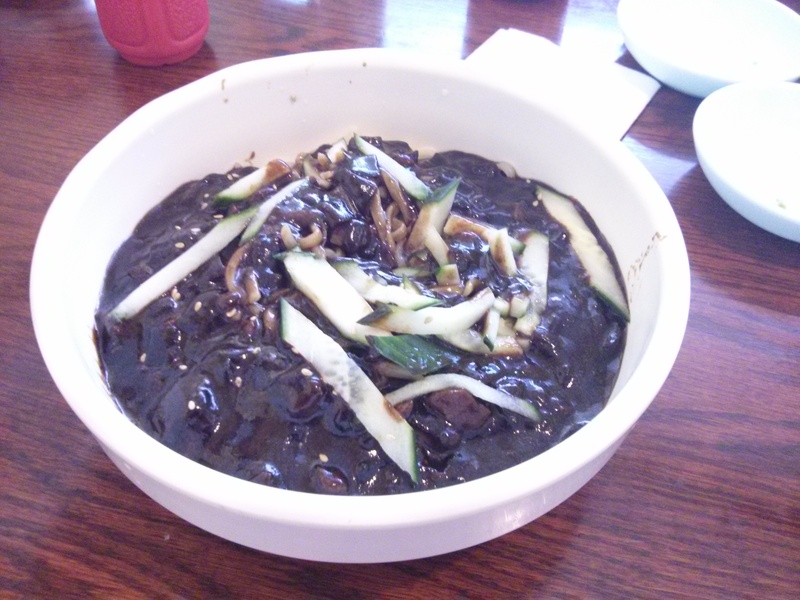 Jajamyun is blackbean noodles with minced pork and cucumber slices. 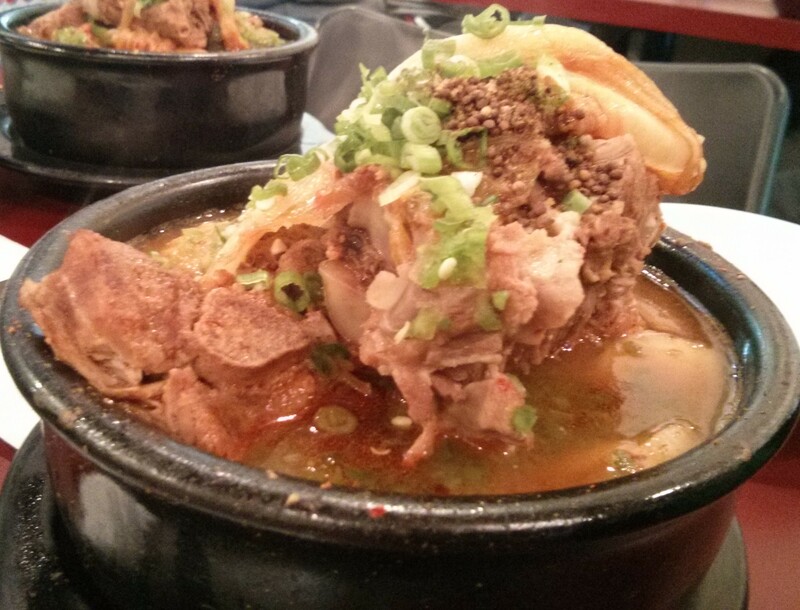 My friend really liked the naengmyun. 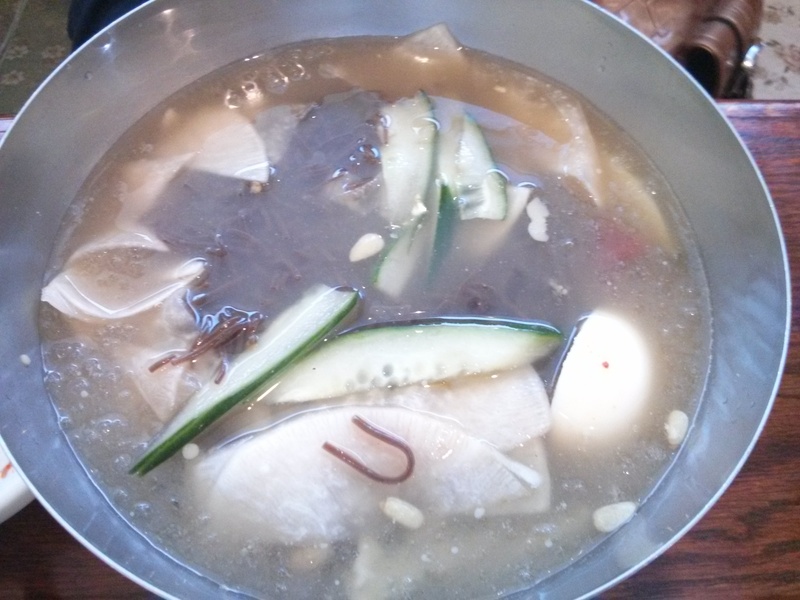 She was able to finish her naengmyun while I had lots of leftovers since the variety of kimchi made me full. 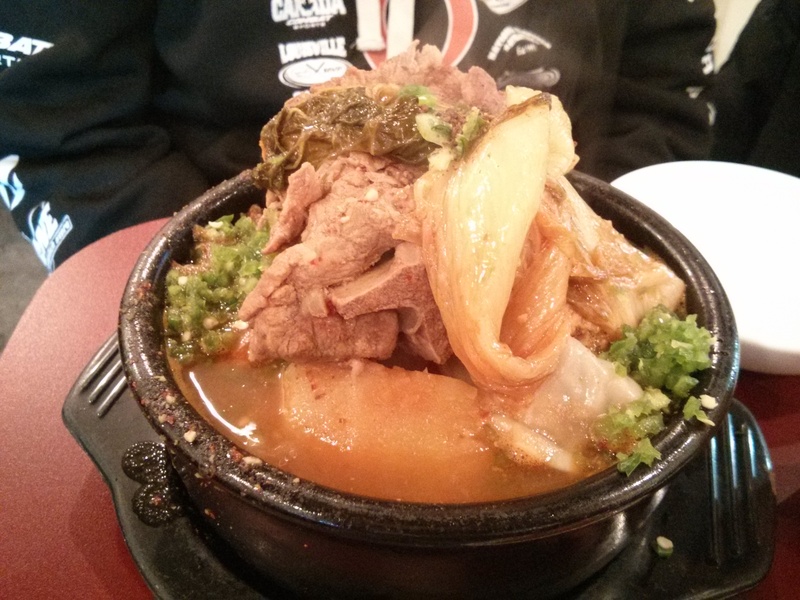 If you want Korean food (excluding pork bone soup and soon tofu), I recommend this place in North York.